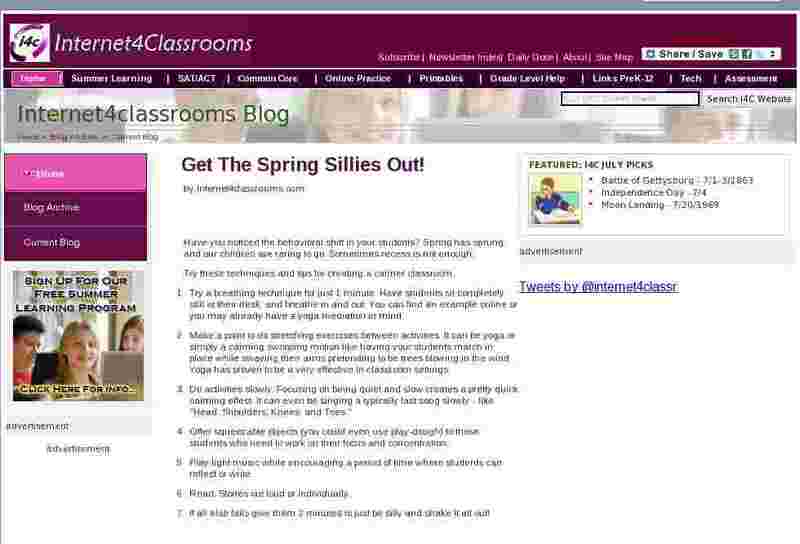 Get The Spring Sillies Out! Have you noticed the behavioral shift in your students? Spring has sprung, and our children are raring to go. Sometimes recess is not enough. Try these techniques and tips for creating a calmer classroom. Try a breathing technique for just 1 minute. Have students sit completely still at their desk, and breathe in and out. You can find an example online or you may already have a yoga mediation in mind. Make a point to do stretching exercises between activities. It can be yoga or simply a calming swooping motion like having your students march in place while swaying their arms pretending to be trees blowing in the wind. Yoga has proven to be a very effective in classroom settings. Do activities slowly. Focusing on being quiet and slow creates a pretty quick calming effect. It can even be singing a typically fast song slowly - like "Head, Shoulders, Knees, and Toes." Offer squeezable objects (you could even use play-dough) to those students who need to work on their focus and concentration. Play light music while encouraging a period of time where students can reflect or write. Read: Stories out loud or individually. If all else fails give them 2 minutes to just be silly and shake it all out!